Ready, Set, Go Wonder Women! I had been planning to start running again after a failed attempt at completing my first marathon in Florida at the beginning of the year. But as many of you know, getting in a physically active state-of-mind is easier said than done. 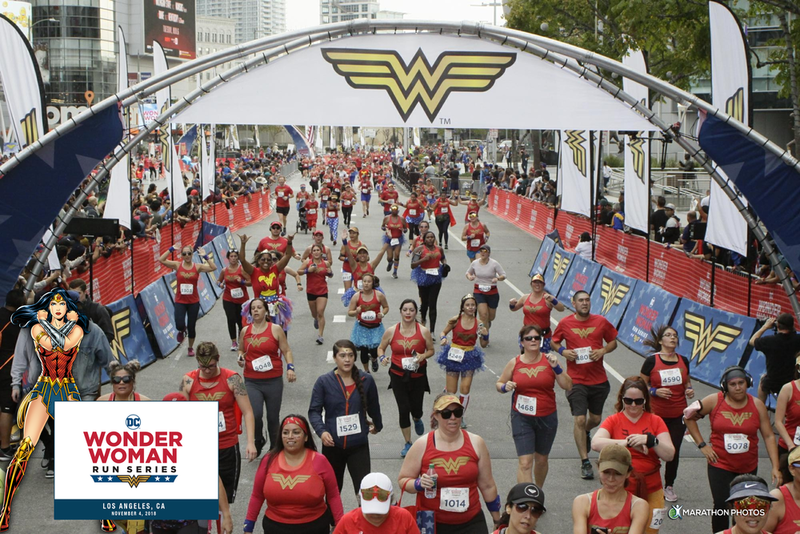 Fortunately, I had the opportunity to join KidsEmbrace and Sun-Staches over the weekend for a badass Wonder Woman Run (the first of its kind in Los Angeles)! Upon crossing the finish line, a shiny gold medal awaited, as did boxes of delicious donuts…but most important was the satisfaction of knowing I had pushed myself to run again! took place at L.A. Live. There was a 5K and a 10K option. I signed up for the 5K because even 3.1 miles seemed like a difficult task. Runners had to pick up their race bibs in front of the Staples Center at L.A. Live the day before the race. Picking up the bib also meant an opportunity to get a fun picture with Wonder Woman herself! The 5k race began promptly at 8am. I started off slow and didn’t really pick up the pace until about mile two. At that point, I jogged a little faster, hoping to beat my personal time goal of 45 minutes. Guess what friends? I did it! I finished three point one miles in under 39 minutes! It was a great experience and I’m now motivated to continue my running journey. The goal? To complete my first marathon in the not-so-distant future! Moments before crossing the finish line! the run and invited me to join them— KidsEmbrace is a unique child car seat company that focuses on “putting safety first”. Their Wonder Woman children’s car seat has proven to be tremendously popular. Sun-staches are a new, fun style of sunglasses, devoted to creating the most innovative and transformative novelty eyewear and party glasses on the market. Both companies offer unique Wonder Woman designs that make you want to put away your fairy wand and bring out the Wonder Woman tiara! Thanks so much KidsEmbrace and Sun-Staches… what a great way to kick-off year-end activities! To learn more about the DC Wonder Woman Run, visit the website here. Thanks for reading, friends and I hope to see you at the next run! I received a complimentary race registration from KidsEmbrace and Sun-Staches. All opinions are my own.